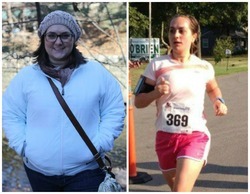 Jamie knew that to lose weight and make a permanent change in her life, she had to take the extra steps. This meant not just working out, but eating right, and planning ahead. At first, she struggled with the new adjustments, but once she got the hang of it, she started to see real results. Now, at over 80 lbs. lost, and a year maintaining, Jamie feels more like herself than ever before. 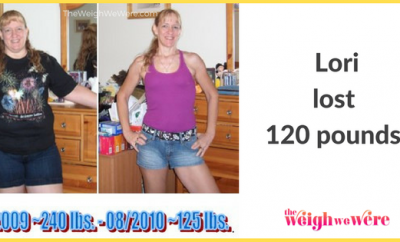 I came across a blog of a woman who had lost 100 lbs by using a Wii Fit. In reading her story, I couldn’t believe that someone could achieve that in a way that seemed so fun! Inspired, I bought a Wii Fit, and a few days in I realized that to make this really work, I needed to focus on my eating habits as well as my exercise, and thus my journey began! Twice before I had experimented with quick weight loss; once by prescription medication targeting weight loss, and once by an extreme fast (I would only eat once a day, but allowed myself anything I wanted within a 1 hr time frame). Each time I lost 20 lbs quickly, and gained 20+ lbs right back, just as quickly. To reach my goal, I really had to do the ground work. I figured out how many calories I needed to consume to start losing, and jumped right in! I made sure that I logged every morsel and drink that touched my lips. I upped my exercise, but I was much less consistent in that. I started eating a lot more lean meats and seafood, and a lot less cheese and “extra” types of foods that we commonly use to add flavor (like ranch dressing). I made sure that I didn’t restrict anything from my diet, and that if I was really wanting something, I would either find a lower calorie alternative, or figure out how to make it work in my meal plan for the day. I logged a lot the day before or at least the meal before, and found that helped a lot in cutting back on cravings. I believe my kitchen scale was instrumental in my success as well, as I noticed that eyeballing measurements was often VERY off. Hands down, nutrition was the most important part! Calorie count was my first window into the nutrition and logging world, and I never could have done it without it! The community by itself is beneficial; sharing stories, recipes, ups, and downs. I still receive the daily e-mails from Calorie Count, and love the mix of helpful and knowledgeable articles, recipe swaps from Hungry Girl, and forum topics from other users! The most difficult part was figuring out how to “eat fun” and listen to my body. But once I got in the rhythm, it was as if I’d been doing this all my life! I still sometimes feel frustrated by having to weigh everything out before I eat, but for the most part it is like second nature; it’s just what I do! I remember feeling very frustrated the first month/month and a half. I felt like I was working harder than the progress I was seeing, but I stuck with it anyway. At the two-month mark, I really started to notice a difference on the scale, in my clothes, in the mirror, and in my own self-confidence. From there, that was the motivation to continue in and of itself! It’s hard! But the most important thing is to continue to log. I read a lot of testimonies/tips on maintaining once I started to near my goal, and everyone agreed: you have to keep logging. Another consistent tip was to keep a regular exercise schedule. I watched a documentary that explained how calorie reduction is the most important part of losing, and exercise is the most important part of maintaining, and I have definitely found that to be true! I finally feel like myself! I feel free from self-judgment (for the most part) and self-consciousness, and I have confidence to boot. Plus, shopping is soooo much more fun. I’ve been maintaining for a year. Admittedly, I’ve gained 5 lbs that I’m struggling to shred again, but I’m not seeing a difference in how my clothes fit, so I don’t beat myself up too hard about it. 5. Find ways to move your body that excite you! ← Previous Story To Thy Ownself Be True…!!! Next Story → When You Feel Beautiful, You Are Beautiful!